Patron Libby Kosmala - TADSA - Technology for Ageing and Disability (SA) Inc.
TADSA must be the only charity whose patron is armed. Our patron Libby Kosmala is a Paralympian who competed at her first Paralympic Games in 1972. 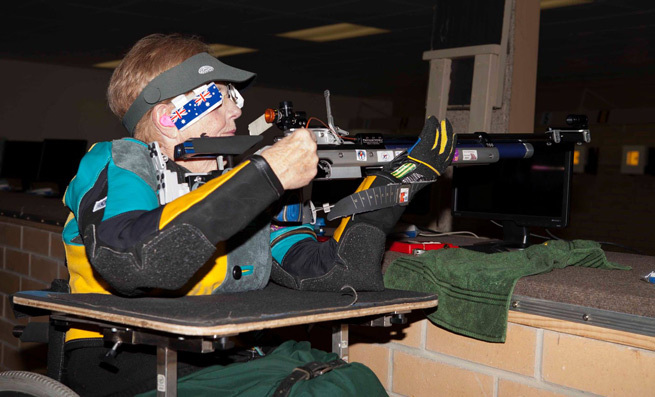 She received a Medal of the Order of Australia in 1985 “for service to the sport of air rifle shooting”. In 1996 Libby was the flag bearer at the Atlanta Paralympic Games. At the 2016 Rio de Janeiro Paralympic Games Libby was the oldest athlete at 74. Around 30 years ago a TADSA volunteer built a table for her, which she leans on when shooting. It’s been to every Paralympics in which Libby has competed (in shooting). The table has assisted her to win many medals over many years. The table comes apart and fits easily into her suitcase. “Technology for Ageing and Disability is an amazing charity. I know this is true because I am not only the patron of the charity but a client, and have been for over 30 years. As you may know, I have competed in 12 Paralympic Games, 11 of these in the sport of rifle shooting. Ordinarily, shooters lie flat to shoot. As I am in a wheelchair this is not possible, so I needed something that I could rest upon, and also have a place for my ammunition. The inventive volunteers (all those years ago) made a table for me which fixed this problem. As I have to take it all over the world for international competitions, it has to be a light weight folding (I pack it in my suitcase) table. They accomplished this and it’s been with me ever since. It’s probably fair to say that this table has helped me win my nine Paralympic gold medals! TADSA volunteers are still assisting me all these years later. Recently, two volunteers completed some modifications to the wheelchair I use for competition to make it easier for me to control. Another volunteer has helped me with my hobby of gardening by fitting a bucket holder to my everyday wheelchair, to make weeding easier.